Earn your GED for Free at ASN Preparatory Institute! ASN Prep is designed as a 12-week program to strengthen proficiency in Language Arts, Math, Science, Social Studies, and Writing; and to build students' confidence for passing the GED test. Are you or do you know someone 17-21* years old in Chicago and Out-Of-School? 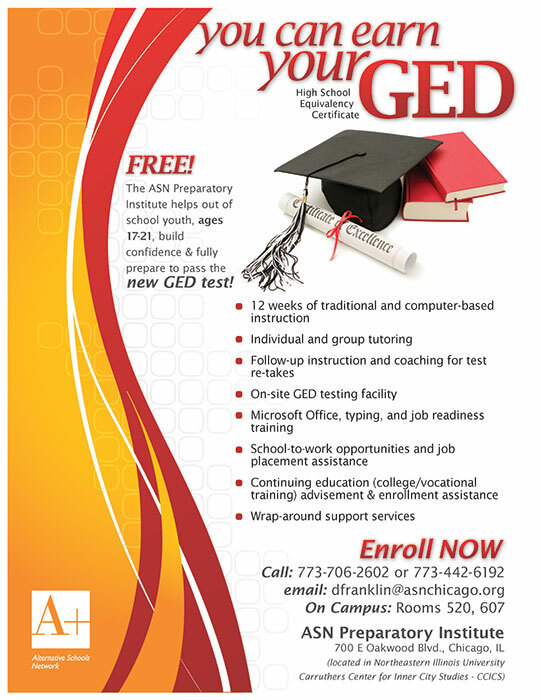 Enroll in the ASN Preparatory Institute and pass the GED Test for FREE! * Eligibility age is 16-20 years old for youth in Illinois foster care. Click Here to Send an Email to ASN Preparatory Institute! Click Here for More Information About ASN Preparatory Institute in Chicago! Click on the videos below to hear from 2015 graduates of ASN Preparatory Institute and the 2015 Commencement Address given by Leon Rogers from 107.5 WGCI Radio! Please share this with your family and friends! Click the buttons below to share on your Facebook or Twitter pages. Also, Forward in an email!